CalRecycle oversees the nation’s largest electronics recycling program. Now fifteen years in, they've announced that they've cumulatively diverted 2.2 billion pounds of CRT glass and other hazardous e-waste from landfills. CalRecycle's program is widely considered a model for sound electronics policy and is vaunted as the most successful program in the country. The California Right to Repair Act (Bill AB2110) was introduced this year by hero Assemblywoman Susan Talamantes-Eggman (D, Stockton), but it was defeated in part by Apple's concerted lobbying efforts. And despite widespread public support for nineteen Right to Repair bills introduced across the country, none have passed yet. Even though CalRecycle has made great strides in improving recycling, 55 billion dollars of electronics value is still lost each year worldwide as a result of being trashed instead of reused. Shirley Wild-Wagner with CalRecycle explained that their guiding question when developing the report was, “How do we decrease the environmental impact and increase the economic usefulness?” Well, a Right to Repair law in California would be a major step in the right direction. 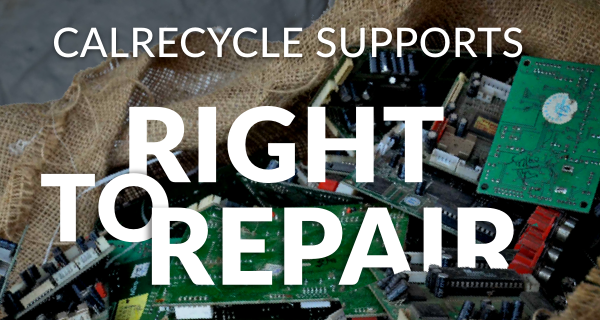 You can read the full story of CalRecycle's report on IFIXIT's blog.